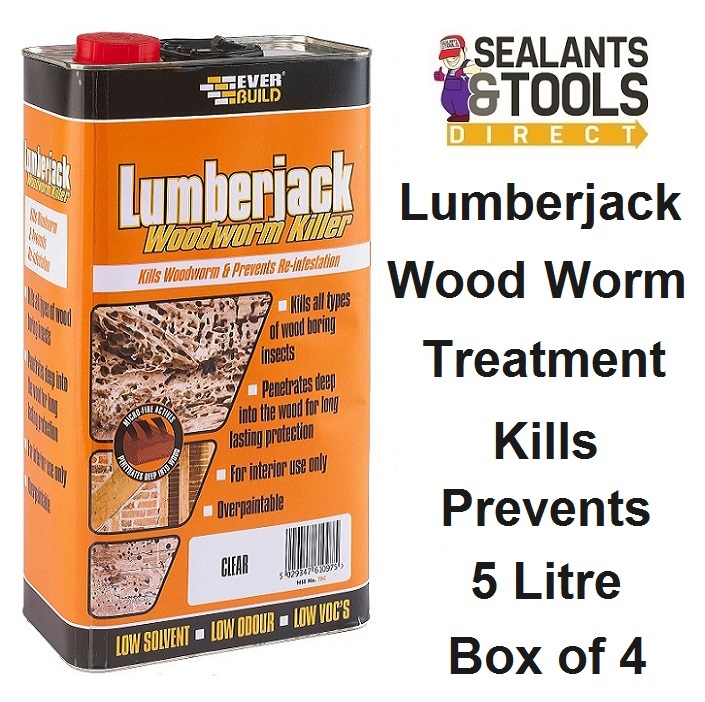 5 Litres of Ready to use Wood worm Killer treatment Used for the eradication of all types and life stages of wood boring insects and their larvae, aspecially woodworm. Woodwork and joinery such as doors, window frames, roof timbers, floorboards, joists, rafters, etc. It can be over painted, stained, varnished, or polished when dry if required. Actively kills and protect against re-infestation. Apply by brush, spray or dipping. Apply a minimum of two coats if brushing or spraying. Second coat should be applied after the first coat has fully soaked in but before it is dry. Where possible, dip or flood the end grains of the timber for maximum protection. Apply 2 coats at a rate of 1 litre of product per 3 to 4 meters Square of surface. Approximately 1 hour depending on temperature. Ready to use do not dilute. Do not use in food preparation areas.